Theatre in Toronto gets interactive with this darkly comedic production from the Templeton Philharmonic. If you’re looking for a laugh-filled evening and interactive theatre experience with the added luxury of air conditioning, get yourself to Sockdolager before it’s too late! Hilariously funny with a touch of twisted macabre, this performance offers each audience something a little different every time. Boasting a different ending at every performance, audience members are invited to bring their ticket back and see the performance as many times as they’d like (space permitting!). Created by the Templeton Philharmonic (the spectacular duo of Gwynne Phillips and Briana Templeton), this dark comedy is performed at the historic Campbell House, a beautiful historic home that seems out of place in downtown Toronto. Taking place in “Toronto the Good,” the scene is set at a party hosted by society girl and Hollywood hopeful Adeline Sweetman, and her hilariously inartistic artist brother, Felix. Other guests include a dry-witted valet, a Ponzi-scheme-entangled business man, a sleep-deprived musician, a wannabe film producer, the sensual trapeze artist Bombyx Mori, a disgruntled cook, and Edith, the nosebleed-prone wife of Felix. Every member of the cast did an absolutely fantastic job in this performance, although my favourite may have been the valet Roland, played by Miguel Rivas. I may or may not have been yelled at by him while attempting to follow what turned out to be his sneaky ploy to see how closely people were paying attention to his instructions. The two creators also really proved their talent with Philips doing a great job of portraying the neurotic, stick-in-the-mud Edith, while Templeton stood out for her role as the sultry Bombyx Mori. This duo actually won the Best Comedy Duo Award at the LA Comedy Festival, an impressive feat that really showed how great their chemistry and comedic timing has proven to be. Without giving too much away, the way the performance works is that the audience begins as one group, watching the actors have drinks in the dining room. Then the audience separates into three different groups. Each group follows their actor/guide, and is privy to a scene involving two of the actors in mini-sub plots that contribute to the overall story. Each group of three rotates to see each scene and everyone comes together again in the ballroom where things wrap up in a crazy way. 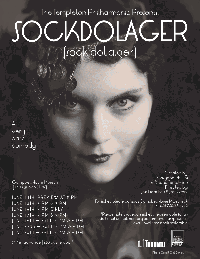 I would highly recommend Sockdolager to anyone looking for a fun night out. At less than an hour and a half, it’s the perfect length to amuse and entertain without ever feeling overdrawn and excessively long, as I find a lot of theatre tends to be. And did I mention there is air conditioning?